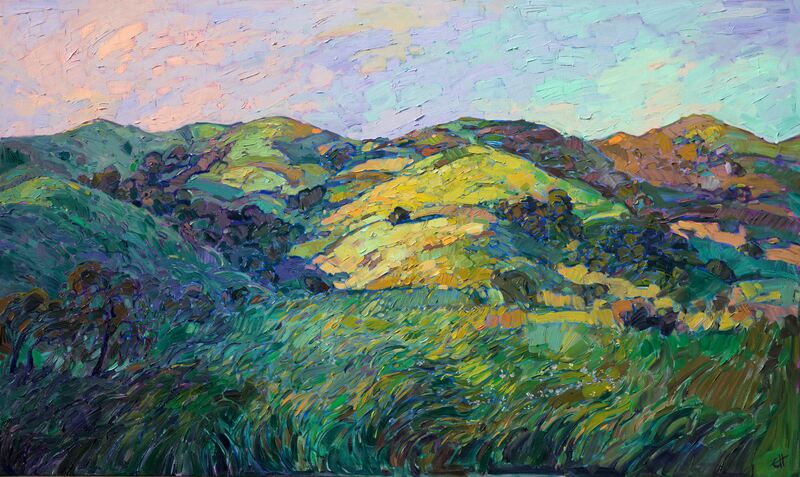 Erin Hanson’s paintings are often inspired by the breathtaking landscapes preserved within National Parks. Because she is located in the western part of the US, she most often depicts the scenery found in California, Nevada, Utah, Oregon, and Washington. All of these states have substantially different landscapes and provide deep and abiding inspiration as Erin visits them throughout their various seasons. The natural vistas of Zion National Park were formed over 250 million years, which makes the park a rich setting for impressionist paintings. The landscape is laid out as if it were made for Erin’s decisive brush strokes and love of color. Red rock canyons loom above lush valleys. Juniper-laden slopes lead to rivers and waterfalls. The sandstone mesas appear to have erupted from the ground, but they are actually formed of rock layers that provide a diversity of vibrancy and texture. Not only do the layers of color lend themselves to vivid paintings, the history of the park is simply incredible. Archeological excavations have found artifacts dating back to 700 BC, when ancient artist attempted to express themselves using pottery as their medium. Erin works to document the years of history that support each sandstone monument and every freestanding arch. 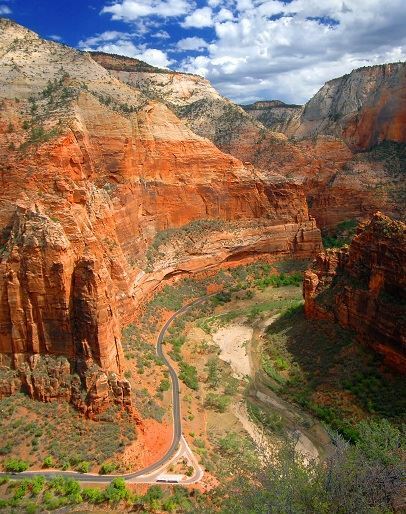 Angels Landing is a truly breathtaking spot in Zion National Park. Like so many incredible vistas, it is difficult to access. The hiking trail is treacherous: one has to hike along a narrow pass flanked by dizzying drop-offs. However, the trail culminates in a vibrant panorama, featuring deep red and orange rock formations with tenacious greenery attempting to scale the enormous cliffs. The hike that inspired the Angels Landing painting by Erin Hanson was made even more treacherous by rain. 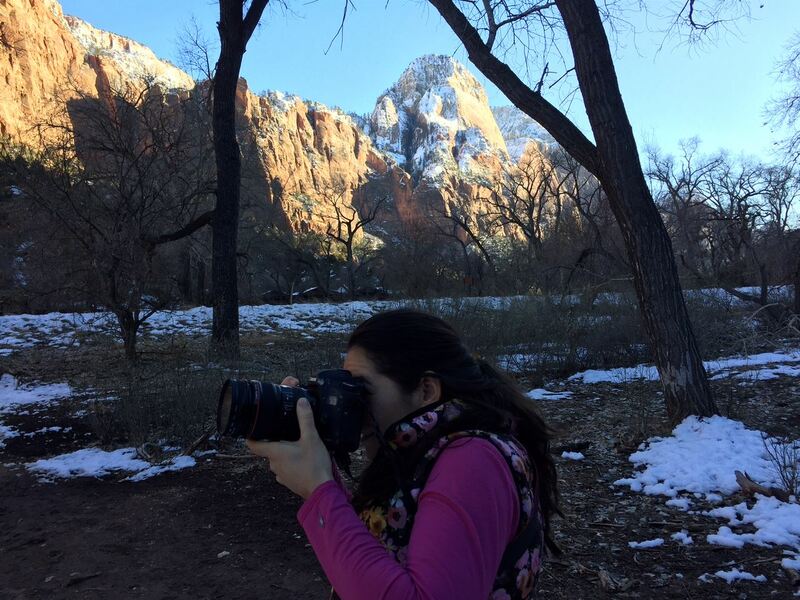 However, she braved the slippery pathways and trails to gain entrance to the incredible sight nature offered. Because of the rain, the red rocks gained additional depth and vibrancy, allowing Erin to paint a truly dynamic piece of art. 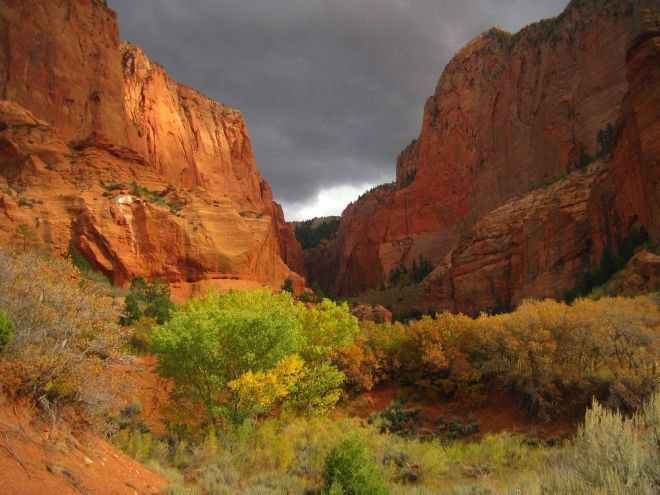 Kolob Canyon is a little-known entrance to Zion National Park that provides visitor access through Kolob Canyons Road. From this entrance, park visitors can go on hikes, ramble along on a drive, or simply enjoy the scenery. Kolob Majesty depicts the northwest corner of the park. Here, two box canyons jut up through the earth like huge monoliths. 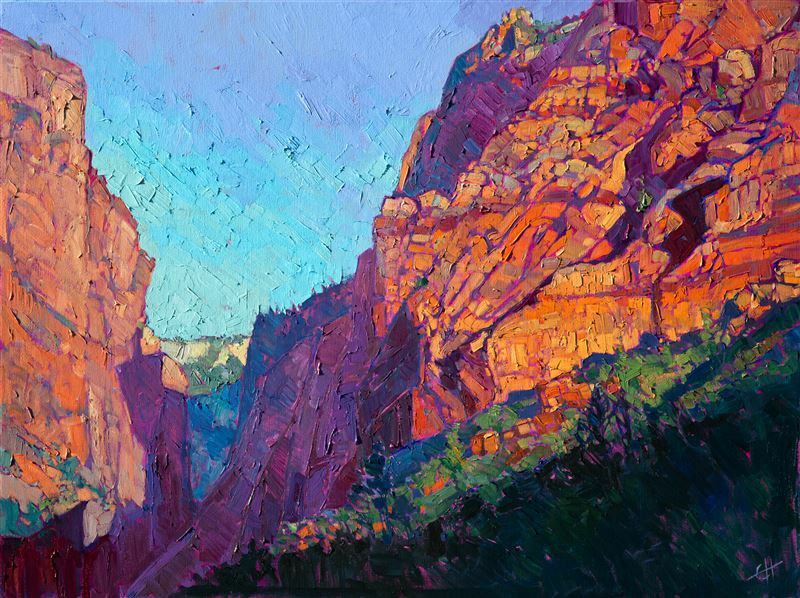 In this vibrant painting, Erin captured the canyons at sunrise. 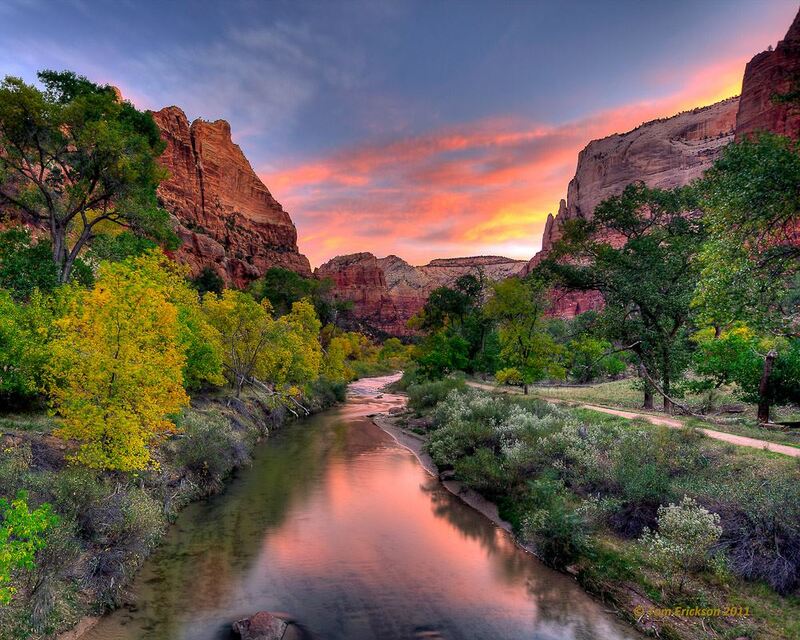 This is the time of day when the canyons dance with startling colors. The play of light upon each layer of rock, the valley still in darkness, and the sunlight barely reaching the tops of the local foliage sets off the innate beauty of this place. 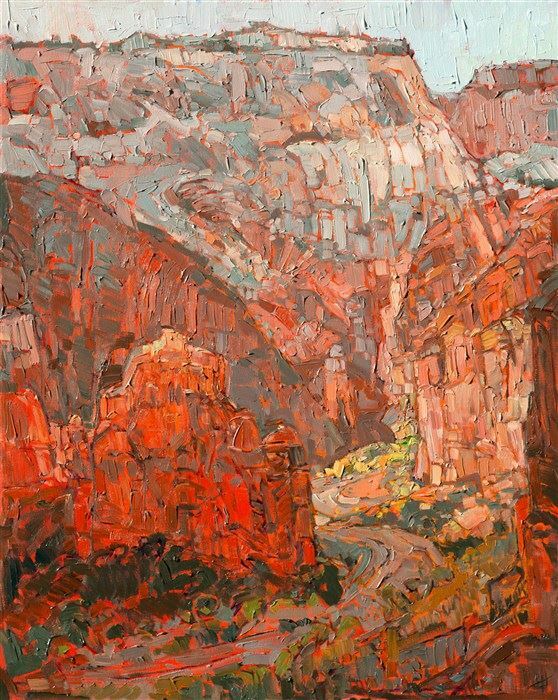 No one can visit this canyon or view Erin’s painting without the enchantment of the landscape leaving an indelible mark upon their soul. Zion Lodge is located within the park itself. The low-lying buildings of the Lodge along with the small cabins simply accent the incredible canyons that surround the spot. Near the Lodge you will find a river lined with cottonwoods and other gorgeous greenery. 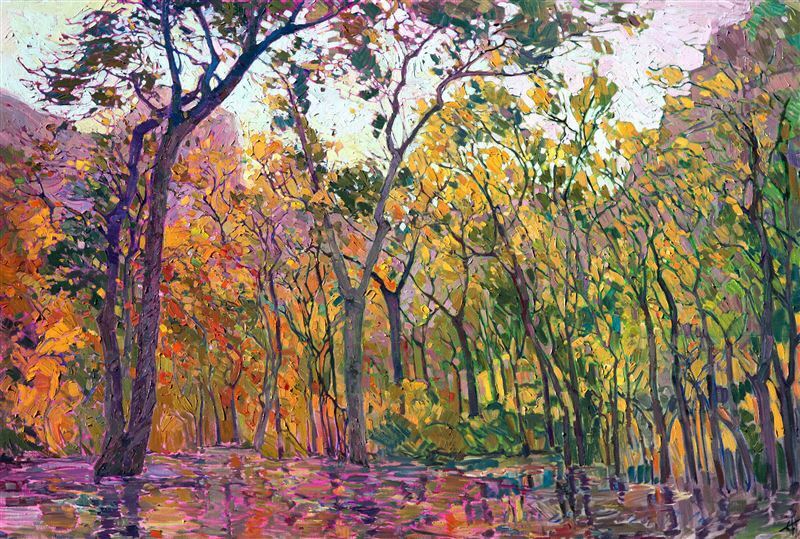 Erin visited the Zion Lodge in autumn and was able to capture a rainy afternoon in her impressionist painting At the Lodge. This depiction brings the viewer into the trees and allows them to enjoy the incredible fall foliage. The patchwork of autumnal color is made more vibrant by the low light and rainy-day depicted in this incredible piece. 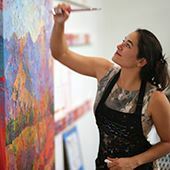 Currently, all three of these paintings, along with several others, are on display at the St. George Art Museum as part of the Erin Hanson's Painted Parks exhibit. The exhibition features a wide variety of impressionist paintings that feature her love of our National Parks. 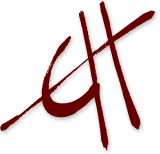 You can view the entire exhibition here or by visiting St. George Art Museum through May 28th, 2016.